The Scornet Maestro (タテゴトハチスズメ?, lit. 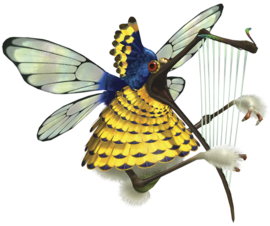 : "Harp Hummingbird") is a boss in Pikmin 3, found in the Twilight River, and is the fourth major boss encountered in story mode. It quickly abducts Louie before the player can reach him. It seems to be like a queen bee of sorts, since it is able to command a swarm of Scornets using its harp-like beak. The Scornet retinue is used to attack the leaders and their Pikmin. The boss relies heavily on the Scornets, as it has no way of attacking. It cannot be attacked while its swarm is surrounding it, requiring the leaders to aim their Pikmin (preferably Winged Pikmin) at the boss after it exposes itself, after one of its coordinated attacks. Once defeated, the Scornet Maestro will drop a Seed Hive and Louie, and all 100 of the Scornets it commanded will instantly die. ↑ This enemy is not collectible in Mission Mode. This value is obtained from the game files. “The Scornet Maestro is located in the Twilight River. As its name implies, this creature attacks by controlling a swarm of scornets. The Scornet Maestro is well defended by its minions. Avoid attacking while the Scornets are in the area. Each time the Scornets move into a tight formation, avoid their attack and allow them to fly out of the area. When it's safe, use your Winged Pikmin to wrestle the vulnerable Scornet Maestro to the ground, then have the rest of your squad charge in to attack. When the Scornets return to the area, gather your Pikmin and repeat the process. In Defeat Bosses!, the player can refight the Scornet Maestro. The time limit is 10 minutes. The only exit of the arena is blocked off by a "keep out" sign. The Scornet Maestro itself is harmless and has no direct way of damaging Pikmin. However, it commands the Scornets to attack for it with its harp-like mouth. All attacks by the Scornets have the same effect: the Pikmin caught in the attack will be held by the Scornets for a certain amount of time, and if not freed, will be killed. The Scornet Maestro will order the Scornets to get into a cone formation and will aim at the active leader. Simply move around a lot to dodge. The Scornet Maestro will order the Scornets to get into lines, and each line will proceed to aim at the active leader. Walk around the outer edge of the arena to dodge. The Scornet Maestro will order the Scornets to form a circle around the active leader. Have a few Pikmin kill some Scornets to escape the circle. If any Pikmin are captured, the Scornets will form a circle around the Maestro and will eat them after a few seconds. Throw Pikmin at the Scornets to save them. The strategy is mainly to defend your Pikmin from the Scornets and then attack the Scornet Maestro. As the battle progresses, it will create different formations with its retinue in an attempt to destroy your swarm. Note that this boss completely relies on its own swarm to attack, possessing no offensive moves of its own besides shaking off Pikmin. The first formation is a gigantic cone-like pattern and is the easiest to avoid. The attack is simple to dodge: just wait for the formation to strike and strafe around the swarm. If any Pikmin are captured by the swarm, it will move around the boss in a circle formation, holding the captured Pikmin. The swarm must be attacked swiftly to free the Pikmin. If the Pikmin aren't released, they will eventually die. The second formation is an array. It will release one line after another to attack your Pikmin. This formation can be tricky to avoid, as the lines of Scornets adjust their flight if you try to run around them. However, as the Scornets are gathering in the array, they are extremely vulnerable to Pikmin attacks. Rock Pikmin seem to do well at picking off Scornets in this formation. The third formation has the swarm forming a circle surrounding you, slowly closing in. If any Pikmin are left behind inside the circle, they will be captured. You need to use your Pikmin to create gaps in the circle to allow your group to escape. To avoid leaving Pikmin behind, use an ultra-spicy spray to create a hole quickly and get out faster. If all the Maestro's Scornets are killed, it will use a period during which it would normally create an attack formation to summon more onto the field from the trees in the background. Once any of the formations are complete, the swarm will temporarily leave the boss, giving you a chance to attack it. To strike it, throw Pikmin at it, preferably Winged Pikmin. Once enough Pikmin are latched onto it, it will fall to the ground, allowing any ground-based Pikmin to swarm it as well. When it dies, it will drop a large fruit, alongside Louie. Its body, alongside the corpses of its swarm, can be taken back to the Onion. As with all bosses in the game, the Scornet Maestro's corpse produces 50 Pikmin. Due to the way the Scornets dive to attack, it is possible to avoid their primary attack, the cone formation, by simply being really close to the walls that surround the arena. When the Scornets dive in, they quickly turn back up to be able to exit the arena, and won't dive low enough to catch Pikmin. This is not fool-proof though, as the Scornets can still catch some Winged Pikmin that are flying a bit too far from the walls. The Scornet Maestro will only attempt to attack the leader that is currently active. This can be used to an advantage by having an unoccupied leader stand away from another leader who has all the Pikmin. When the Maestro begins an attack, it will lock on the current leader, and will not switch targets, meaning that at this point, you can swap from the defenseless leader to one with Pikmin, and attack it by swarming it with Winged Pikmin. Once it falls to the ground, pelt the creature with Rock Pikmin to rapidly diminish its health. The lonesome leader will receive damage from the Scornet attacks, but unless their health was low at the start of the battle, they will be able to endure the strikes without much of a problem. Due to the scripting of this boss battle, this process must be done at least four times to take down the boss. If the Scornets are attacked before charging and several are killed without any Pikmin being captured, the time between each attack is significantly reduced. This strategy will allow for a quick defeat in under three minutes. In Mission Mode with two players, the boss will only ever target the first player's leader. The Scornet Maestro's name is the same as a Scornet's, but with "maestro"; a maestro is the person that conducts the music in an orchestra. Its Japanese name is also the same as the Scornet's, but starts with the word "Harp", making it タテゴトハチスズメ? (lit. : "Harp Hummingbird"). Finally, it shares the internal name with the Scornet, except with boss appended to the name, making it mureboss. French Maestro apidar Portmanteau from Latin apis (bee) and French dard (sting), and Maestro. The first encounter of the Scornet Maestro. The Scornet Maestro roaring as it first appears. The boss being weighed down by Winged Pikmin. Front view of the Scornet Maestro. The Scornet Maestro as it dies. The defeated Scornet Maestro, surrounded by its fruit and Louie. The deceased carcasses of the Scornet Maestro and its Scornets. The data file on the Scornet Maestro. The Scornet Maestro is the second airborne boss to appear in the series, the first being the Vehemoth Phosbat; both appear in the same game. 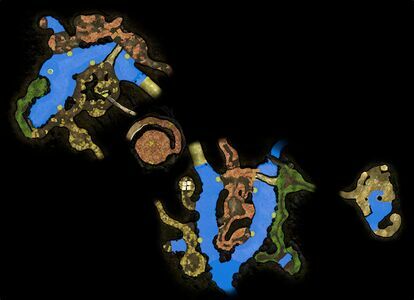 The Scornet Maestro is the smallest boss in the Pikmin series. The Scornet Maestro is similar to a boss in another Nintendo game, Metroid Prime 3: Corruption, Helios. Both Helios and the Scornet Maestro are smaller bosses (in comparison to other bosses) that use smaller minions to both protect themselves and attack the player. During its battle, even if the player locks-on the Scornets, it will say Scornet Maestro instead. Interestingly, when the Scornet Maestro is defeated, not only will the Maestro's corpse fall, but all the Scornets as well, which can be brought back to the Onion. Normally, Scornets are not retrievable when defeated. The Scornet Maestro can command up to 100 Scornets at the same time, much like the player's leaders can control up to 100 Pikmin. This page was last edited on April 5, 2019, at 00:04.